1 Provided by Friends Life Life Insurance Your Policy Conditions Key features of Tesco Bank Life Insurance Inside you ll find full details about Tesco Life Insurance. 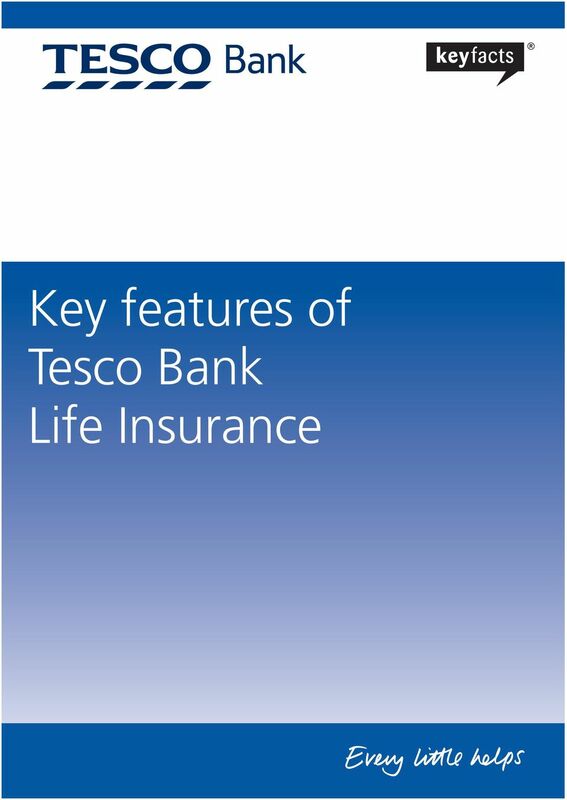 2 Key features of Tesco Bank Life Insurance Tesco Bank Life Insurance is provided by Aviva Life & Pensions UK Limited. Any references to we, us or our refer to Aviva unless stated otherwise. You can use this policy to cover up to two people usually yourself and your partner, spouse or civil partner. Once you ve taken out your policy, we will send you a policy schedule which shows what is included and who is covered. Is it right for me? Yes, if you: Want a cash lump sum that will be paid out if you die or are diagnosed with a terminal illness during the policy term. No, if you: Want a policy that covers you if you are diagnosed with a critical illness. Want a regular income to cover your monthly expenses if you re ill or injured. Want a whole of life policy, which means you want to be covered for the rest of your life. Want to be able to stop your policy and get your money back. What to do next: This is a guide. Please ensure you read this key features document for further information to ensure you re happy the product is right for you. Choice of cover You can choose from two types of Tesco Bank Life Insurance: Level cover This cover is often used to help pay off an interest only mortgage. It can also be used to help protect your family. The cash lump sum we ll pay stays the same throughout your policy term. Mortgage decreasing cover This cover is used to help pay off a repayment mortgage. The cash lump sum we ll pay decreases each month broadly in line with the amount outstanding on a capital and interest mortgage. It reduces by a fixed monthly interest rate. The cash lump sum can be used to help protect your family and/ or your mortgage: If you want to protect your mortgage, the cash lump sum can be used to help pay off some, or all, of your outstanding mortgage. 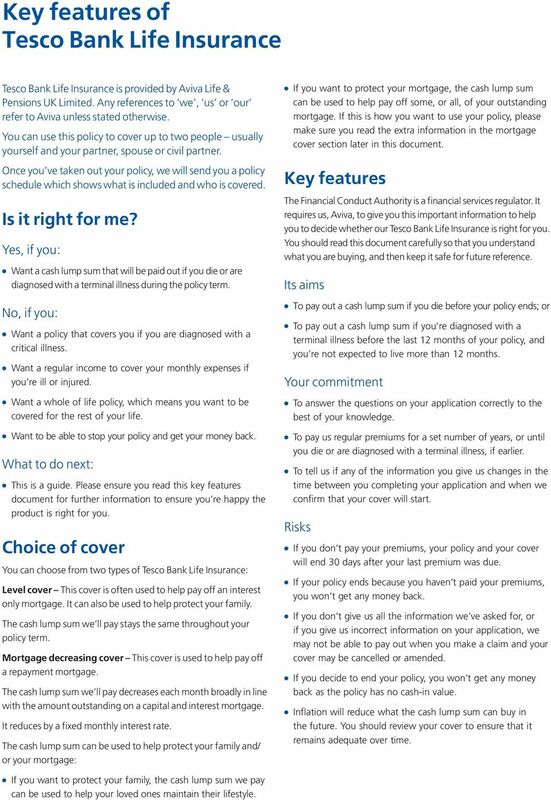 If this is how you want to use your policy, please make sure you read the extra information in the mortgage cover section later in this document. Key features The Financial Conduct Authority is a financial services regulator. It requires us, Aviva, to give you this important information to help you to decide whether our Tesco Bank Life Insurance is right for you. You should read this document carefully so that you understand what you are buying, and then keep it safe for future reference. Its aims To pay out a cash lump sum if you die before your policy ends; or To pay out a cash lump sum if you re diagnosed with a terminal illness before the last 12 months of your policy, and you re not expected to live more than 12 months. Your commitment To answer the questions on your application correctly to the best of your knowledge. To pay us regular premiums for a set number of years, or until you die or are diagnosed with a terminal illness, if earlier. To tell us if any of the information you give us changes in the time between you completing your application and when we confirm that your cover will start. Risks If you don t pay your premiums, your policy and your cover will end 30 days after your last premium was due. If your policy ends because you haven t paid your premiums, you won t get any money back. If you don t give us all the information we ve asked for, or if you give us incorrect information on your application, we may not be able to pay out when you make a claim and your cover may be cancelled or amended. If you decide to end your policy, you won t get any money back as the policy has no cash-in value. Inflation will reduce what the cash lump sum can buy in the future. You should review your cover to ensure that it remains adequate over time. If you want to protect your family, the cash lump sum we pay can be used to help your loved ones maintain their lifestyle. 3 Questions and answers What is Life Insurance? It s an insurance policy which pays out a cash lump sum if: You die during the policy term; or You re diagnosed with a terminal illness before the last 12 months of your policy, and you re not expected to live for more than 12 months. Who can take out a policy? You have to be aged between 18 and 85 to start the policy and a UK resident, this excludes the Channel Islands and the Isle of Man. The policy can last between five and 50 years, but it has to stop before you reach age 91 at the latest. What s included? We include life cover for you, and any other person insured on the policy. We include terminal illness benefit for you, and any other person insured on the policy. Protection Promise (Underwriting Cover) We also include up to 90 days free life cover from the date we receive your application to when we make a decision: We ll cover you for up to 1,000,000, across all Aviva applications, or the amount of life insurance you ve asked for on your application, whichever is lower. This means that where two people have applied for life insurance, each life insured is covered for the lower of 1,000,000, or the amount being applied for. Your underwriting cover ends on the earliest of: 90 days from the date we received your application, or 10 days after we confirm our decision to accept you, or the day we postpone or decline your application. Underwriting cover is intended to provide security and protection against the unexpected. This means it doesn t provide cover if your death results from a suicide or any medical condition that you had when you applied for your policy. Your underwriting cover and policy will be invalid if you have not provided us with complete and accurate information on your application. It s also really important to keep us informed of any changes in your health or medical history prior to your application being accepted or Aviva providing you with our decision or starting cover. Other benefits that can be included: If we accept your policy on our standard terms, it will automatically include a range of other features. Life change benefit If your circumstances change, our life change benefit lets you take out more cover without giving us any extra underwriting information. You can increase your sum insured by up to 100%. The maximum additional amount you can take out is 200,000 or the original sum insured, whichever is lower. You can use the life change benefit whenever your circumstances change before you reach age 55, or the additional cover you have reaches the maximum sum insured, outlined above. You can use this benefit for the following life changes: Getting married or entering into a civil partnership Divorce, dissolution of civil partnership or separation Buying your first home Moving house Improving your home Buying a second home Having or adopting a child Your child/children starting higher education Salary increase of 20% or more. 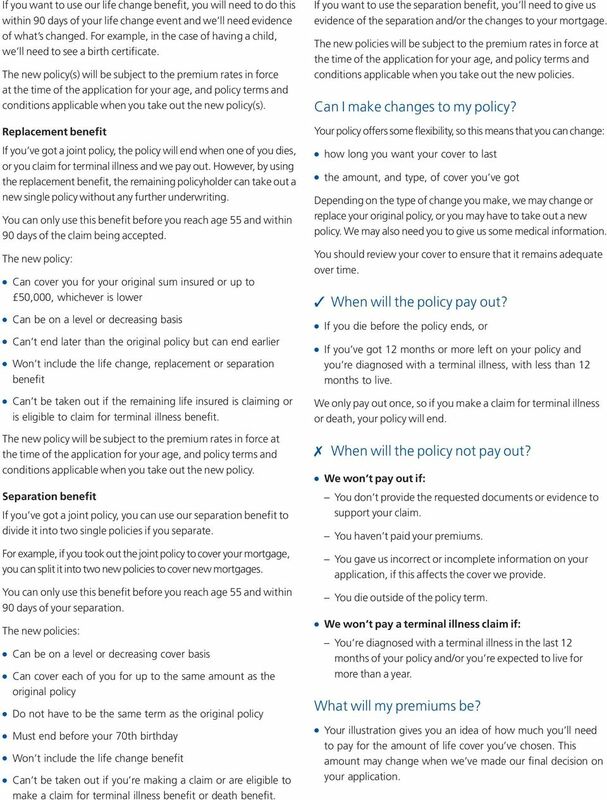 The new policy we set up with the additional cover for life change benefit: Can be on a level or decreasing cover basis Can be on one or both lives, if the original policy was held jointly If the original policy was on a single life basis, this must be for the same life insured Does not have to be the same term as the original policy Must end before your 70th birthday Will be a life insurance policy Will include separation benefit, if held jointly with another person Won t include the life change benefit or the replacement benefit Can t be taken out if you re making a claim or are eligible to make a claim for terminal illness benefit or death benefit. 4 If you want to use our life change benefit, you will need to do this within 90 days of your life change event and we ll need evidence of what s changed. For example, in the case of having a child, we ll need to see a birth certificate. The new policy(s) will be subject to the premium rates in force at the time of the application for your age, and policy terms and conditions applicable when you take out the new policy(s). Replacement benefit If you ve got a joint policy, the policy will end when one of you dies, or you claim for terminal illness and we pay out. However, by using the replacement benefit, the remaining policyholder can take out a new single policy without any further underwriting. You can only use this benefit before you reach age 55 and within 90 days of the claim being accepted. 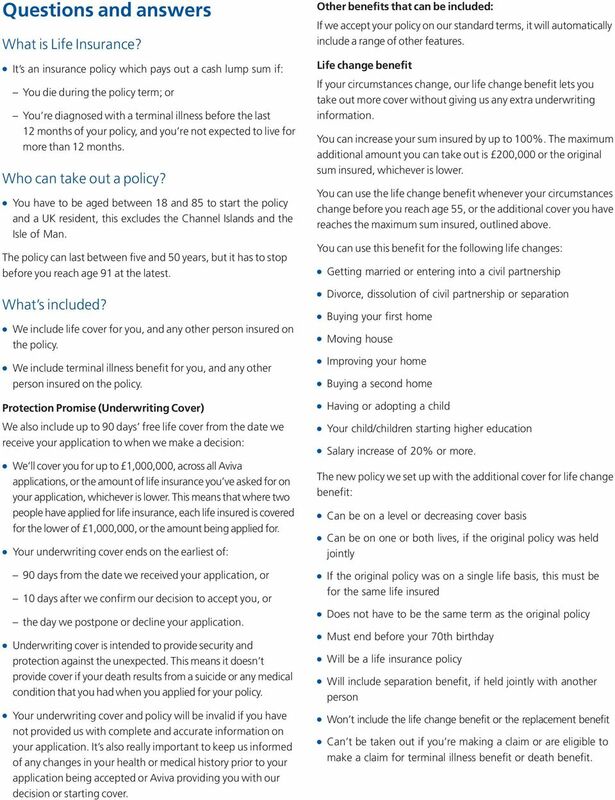 The new policy: Can cover you for your original sum insured or up to 50,000, whichever is lower Can be on a level or decreasing basis Can t end later than the original policy but can end earlier Won t include the life change, replacement or separation benefit Can t be taken out if the remaining life insured is claiming or is eligible to claim for terminal illness benefit. The new policy will be subject to the premium rates in force at the time of the application for your age, and policy terms and conditions applicable when you take out the new policy. Separation benefit If you ve got a joint policy, you can use our separation benefit to divide it into two single policies if you separate. For example, if you took out the joint policy to cover your mortgage, you can split it into two new policies to cover new mortgages. You can only use this benefit before you reach age 55 and within 90 days of your separation. The new policies: Can be on a level or decreasing cover basis Can cover each of you for up to the same amount as the original policy Do not have to be the same term as the original policy Must end before your 70th birthday Won t include the life change benefit Can t be taken out if you re making a claim or are eligible to make a claim for terminal illness benefit or death benefit. If you want to use the separation benefit, you ll need to give us evidence of the separation and/or the changes to your mortgage. The new policies will be subject to the premium rates in force at the time of the application for your age, and policy terms and conditions applicable when you take out the new policies. Can I make changes to my policy? Your policy offers some flexibility, so this means that you can change: how long you want your cover to last the amount, and type, of cover you ve got Depending on the type of change you make, we may change or replace your original policy, or you may have to take out a new policy. We may also need you to give us some medical information. You should review your cover to ensure that it remains adequate over time. 3 When will the policy pay out? If you die before the policy ends, or If you ve got 12 months or more left on your policy and you re diagnosed with a terminal illness, with less than 12 months to live. We only pay out once, so if you make a claim for terminal illness or death, your policy will end. 7 When will the policy not pay out? We won t pay out if: You don t provide the requested documents or evidence to support your claim. You haven t paid your premiums. You gave us incorrect or incomplete information on your application, if this affects the cover we provide. You die outside of the policy term. We won t pay a terminal illness claim if: You re diagnosed with a terminal illness in the last 12 months of your policy and/or you re expected to live for more than a year. What will my premiums be? Your illustration gives you an idea of how much you ll need to pay for the amount of life cover you ve chosen. This amount may change when we ve made our final decision on your application. 5 Your premiums are based on the cover you choose and your personal circumstances. You pay your premiums monthly by Direct Debit. Guaranteed premiums Your premiums are guaranteed to stay the same. What about tax? The cash lump sum we pay out on death or terminal illness is currently free from income and capital gains tax. It may be subject to inheritance tax unless you put your policy in a suitable trust. For details of our trusts, please call for our explanatory brochure. Tax rules may change in the future. Can I change my mind? 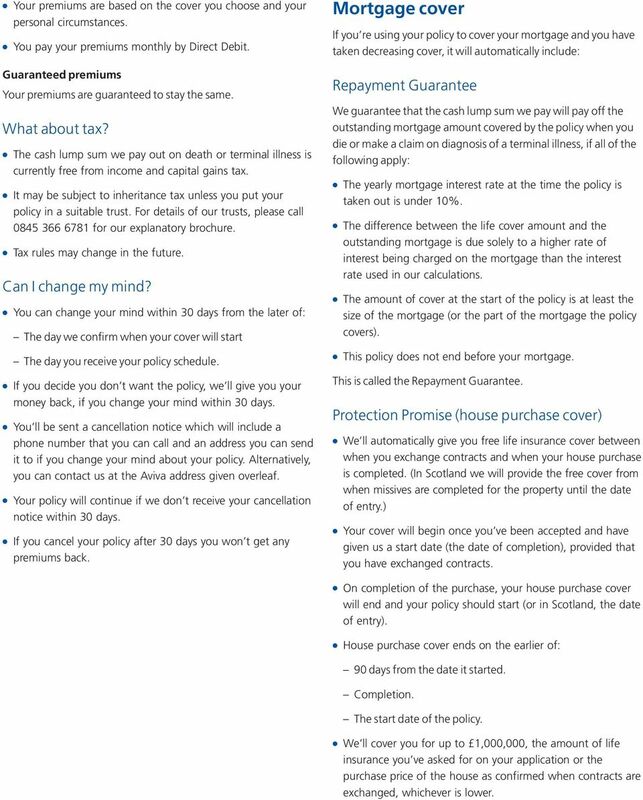 You can change your mind within 30 days from the later of: The day we confirm when your cover will start The day you receive your policy schedule. If you decide you don t want the policy, we ll give you your money back, if you change your mind within 30 days. You ll be sent a cancellation notice which will include a phone number that you can call and an address you can send it to if you change your mind about your policy. Alternatively, you can contact us at the Aviva address given overleaf. 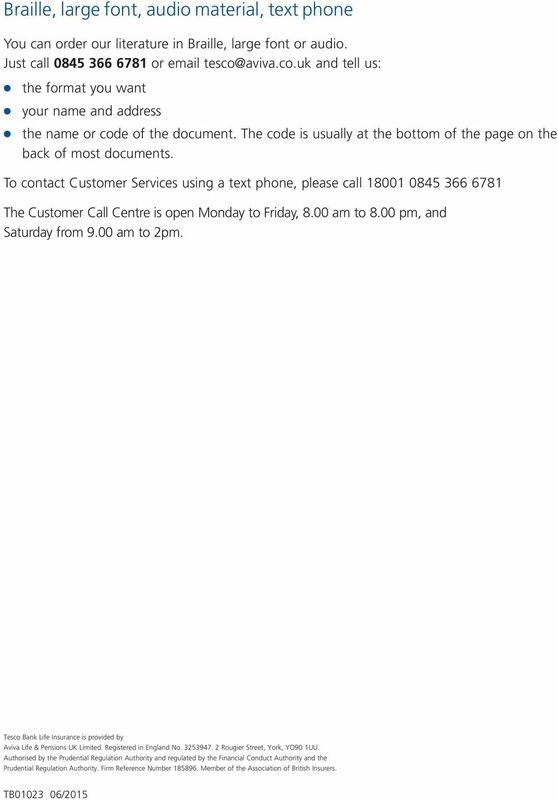 Your policy will continue if we don t receive your cancellation notice within 30 days. If you cancel your policy after 30 days you won t get any premiums back. Mortgage cover If you re using your policy to cover your mortgage and you have taken decreasing cover, it will automatically include: Repayment Guarantee We guarantee that the cash lump sum we pay will pay off the outstanding mortgage amount covered by the policy when you die or make a claim on diagnosis of a terminal illness, if all of the following apply: The yearly mortgage interest rate at the time the policy is taken out is under 10%. The difference between the life cover amount and the outstanding mortgage is due solely to a higher rate of interest being charged on the mortgage than the interest rate used in our calculations. The amount of cover at the start of the policy is at least the size of the mortgage (or the part of the mortgage the policy covers). This policy does not end before your mortgage. This is called the Repayment Guarantee. Protection Promise (house purchase cover) We ll automatically give you free life insurance cover between when you exchange contracts and when your house purchase is completed. (In Scotland we will provide the free cover from when missives are completed for the property until the date of entry.) Your cover will begin once you ve been accepted and have given us a start date (the date of completion), provided that you have exchanged contracts. On completion of the purchase, your house purchase cover will end and your policy should start (or in Scotland, the date of entry). House purchase cover ends on the earlier of: 90 days from the date it started. Completion. The start date of the policy. We ll cover you for up to 1,000,000, the amount of life insurance you ve asked for on your application or the purchase price of the house as confirmed when contracts are exchanged, whichever is lower. 6 How to contact us To speak to someone about your policy If you want to get in touch with us you can call, or write: Call us on (Monday to Friday, 8:00 am 8.00 pm and Saturday 9.00am 2.00 pm) Outside of these hours, you can use the same number and leave us a message. We monitor calls to improve our service. us at Write to us at: Customer Services PO Box 520 Norwich NR1 3WG To make a claim Call our Life Claims Department on Alternatively, we can be contacted on Outside of the UK, the number would be To make a complaint If you ever need to complain you can: Call us on us at Write to us at: Aviva Customer Relations PO Box 3182 Norwich NR1 3XE If you re not satisfied with the response you can write to: Financial Ombudsman Service Exchange Tower London E14 9SR Call or to: Other important information Terms and conditions This key features document only gives a summary of Tesco Bank Life Insurance. You should read the policy terms and conditions. Please contact us for a copy. Law We ll write your contract in English and the law of England will apply in any legal dispute. We ll always write and speak to you in English. Potential conflicts of interest There may be times when Aviva plc group companies or our appointed officers have some form of interest in the business being transacted. If this happens or we become aware that our interests, or those of our officers, conflict with your interests, we ll take all reasonable steps to manage that conflict of interest. We ll do this in a way that treats all customers fairly and in line with proper standards of business. Client classification The Financial Conduct Authority has defined three categories of customer. You ve been classed as a retail client, which means that you ll be provided with the highest level of protection provided by the Financial Conduct Authority rules and guidance. Compensation Financial Services Compensation Scheme (FSCS) We are covered by the FSCS. If we cannot meet our obligations you may be entitled to compensation under the scheme. 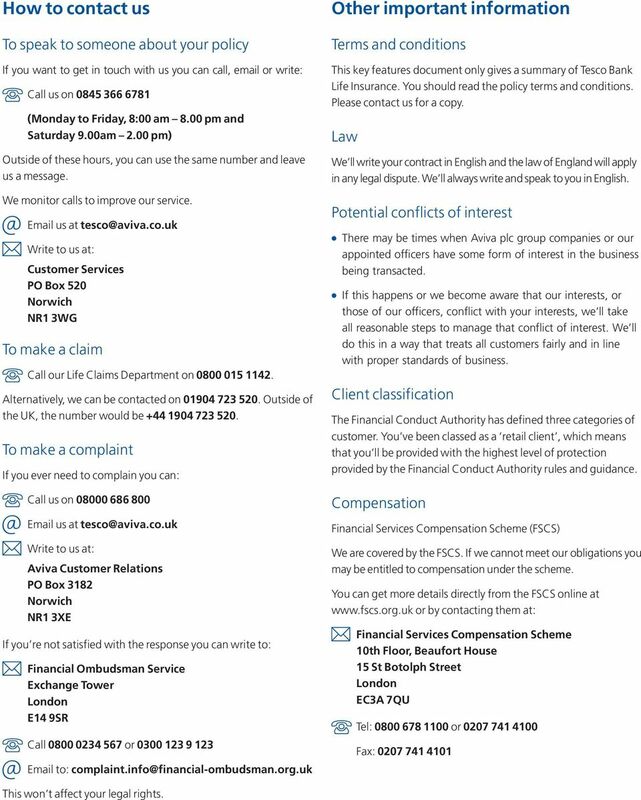 You can get more details directly from the FSCS online at or by contacting them at: Financial Services Compensation Scheme 10th Floor, Beaufort House 15 St Botolph Street London EC3A 7QU Tel: or Fax: This won t affect your legal rights. Life Insurance Options Policy summary Life Insurance Options This summary tells you the key things you need to know about our Life Insurance Options policy. It doesn t give you the full terms of the policy.